After gone to Krabi, this time is for Phuket. We took about 3 half hours to get here by van. Honestly the van was unexpected, old car with broken air conditioner and such a tiny space for 10 passengers in a car. Arrived at Phuket, this i city looks crowded by tourist than Krabi. As my routine, i'd like to have top restaurant spot in here. 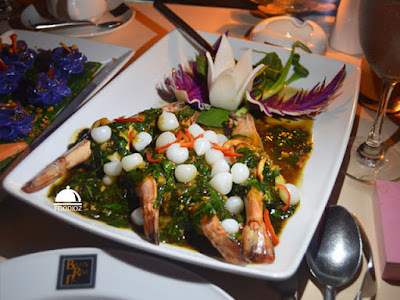 By read the blogs and reviews also recommendation by some people in hotel, Baan Rim Pa is one of famous spot in here. From my hotel, it only took about 5 minutes by walk. What a good thing for me. Baan Rim Pa is local Thai restaurant located close to the beach and we may see a wide sea behind of there. It is huge place for the restaurant and quite many customers that evening. But unexpected waitress welcoming us with unfriendly act actually. She rushing us to chooce the menu and did not even have time to explain to us what recommended dish here should we have. Actually the rest waitress and waiter are doing good but this one is absolutely should have learn attitude more. Good thing, the foods we ordered are comes out really quick. At least i could fulfill my desire. First came out was the Steamed Dumpling with Crab and Chicken. 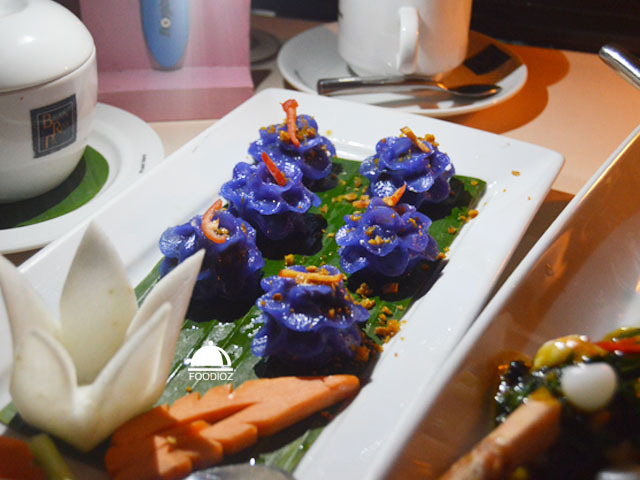 It is beautiful purple dumpling in flower shape, it has nice texture of skin, soft but firm dough. It filled with minced chicken and crab meat blended together such a great combination. Tasty and nice texture as well. Next dish is Pandan Chicken. I had this before in one Thai restaurant at Jakarta, and i did not satisfied with it. 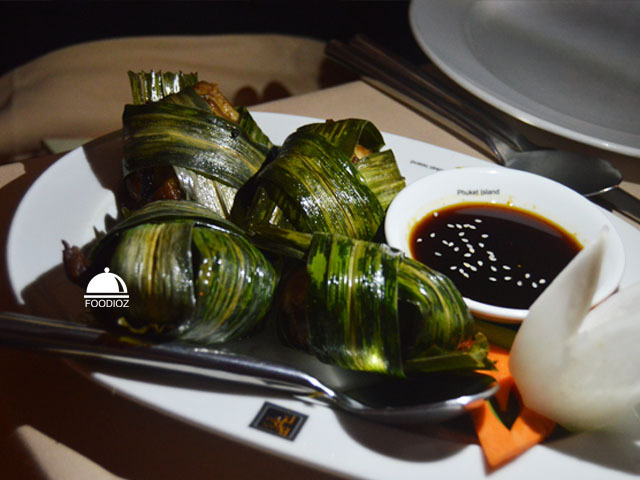 In Baan Rim Pa, they are served huge 4 pcs chickens wrapped in pandan leaf. Actually this is common fried chicken, only it has panda. Fragrance which is good and chicken really soft and has great taste. Last dish i have is Fried Prawn with leaves and pepper. It is stunning dish indeed! Great prawn with full of leaves also ball of onions looks like a pearl around it. 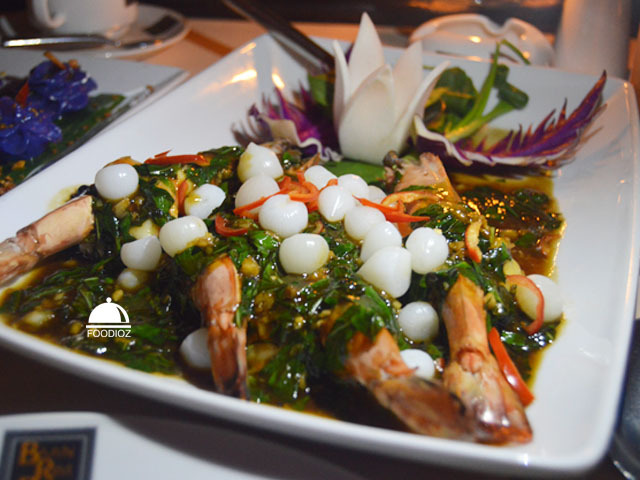 Prawn really huge and it has really great texture perfect with authentic taste also herbs fragrance from the leaves. Make sure you order rice a bowl for two person... it is quite al lot though. Over all foods are great and such a great experience having fine dining at beach cosey island. But just for note this spot has a really high price to spend though and i am feel bad about the service not really fascinating as expected. Hopefully they are noticed about the staff manner should get fix to be better.